The St. Louis fans gave a nice warm reception for not only forward Troy Brouwer, but goaltender Brian Elliott who enjoyed a successful run with the Blues. 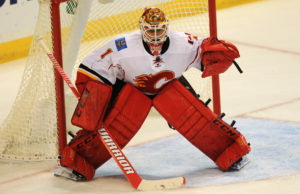 Both players returned and it was Elliott’s night as he turned stone cold and stopped 23 shots in a 4-1 win for his Flames over his former team. Elliott was greeted with chants of “Moose” during the pregame warmups. He appreciated it. After beating the Blackhawks the night before in a shootout, Elliott was ready to go on back-to-back nights and was waiting for this game since the summer. The lone dent on Elliott’s night was a power-play goal from defenseman Kevin Shattenkirk with a 5-on-3 advantage early in third with the Blues down 3-1.